On a day when most Americans are celebrating freedom, I'd like to offer reviews of three cookbooks which I think might be of particular interest to other homesteaders, preppers, or anyone else working toward self-sufficiency. The first is Stillroom Cookery: The Art of Preserving Foods Naturally, With Recipes, Menus, and Metric Measures by Grace Firth. 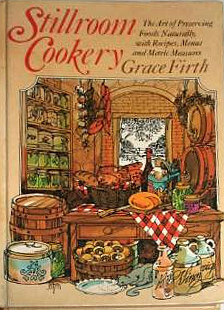 Stillroom cookery, according to the author, is the art of fermenting food. The appeal of this book is not just more recipes for sauerkraut and other lacto-fermented vegetables, but also milk, meat, sauces, and beverages. Ingredients are thoroughly discussed and directions are detailed and loaded with tips. Two sections of the book were of special interest to me - milk and meat. Her cheese recipes are right up my alley because she uses sour milk, buttermilk, sour cream, or yogurt for starters instead of the meso- or thermophilic starters which must be purchased. While I think Rikki Carroll's Home Cheese Making is a good book, I rarely reach for it because every recipe uses purchased starters, while I'm trying to make cheese with starters I don't have to keep buying. For that alone, Grace Firth's book is 5-star to me. The other section I was especially interested in is the chapter on curing meat without the use of refrigeration: brining, drying, smoking, salting, sugar curing. The author does not shun refrigeration and does use it, but the basics here are hopeful for those of us looking for more off-grid methods. The book is not restricted to fermenting food, and has tons of recipes for not only cheeses and meats, but raised dough baking (with a recipe for homemade yeast using hops), fish and fowl, beverages including home carbonated, wines, and beer, how to make vinegar, sauces, and gravies. There are also chapters on cooking dry staples, canning, pickling, and dehydrating. The recipes give both U.S. customary and metric measurements. Published in 1977, there are lots of used copies around. I paid more for the shipping than I did the book. 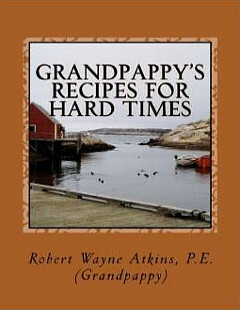 The second book is Grandpappy's Recipes for Hard Times by Robert Wayne Atkins. What initially caught my attention was a recipe for homemade hop yeast. That's right, baking yeast made from hops flowers, flour, sugar, water, and potato. The author's assumption is that almost everyone will come on hard times, including job loss, illness, or disaster, whether that be economic, natural, or manmade. Even those with a hearty food storage may eventually reach the bottom of the pantry barrel. The ingredients and recipes are simple and written for the average family who may not have access to things like eggs and milk. Many of the recipes are either eggless or call for powdered milk. Recipes focus on tomatoes, beans, potatoes, rice, meat, breads, wheat berries, cornmeal, beverages, fish, game, and a nice section on desserts. Additional recipes of interest include homemade pectin, homemade baking powder, jerky, pemmican, acorn meal, and how to make sugar from sugar beets. Yeastless bread recipes include sourdough, salt-rising bread, and Irish soda bread. There are also sections of wild foods and game preparation. If you don't have a food storage, this would be a good book on which to base one. I also like the charts and tips. It's a good addition to my kitchen library. The last is one I mentioned once before, but it came to mind as a good book for food independence. 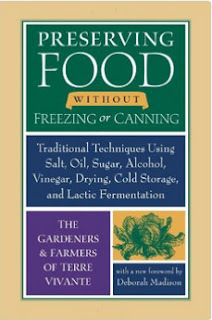 It's entitled Preserving Food without Freezing or Canning: Traditional Techniques Using Salt, Oil, Sugar, Alcohol, Vinegar, Drying, Cold Storage, and Lactic Fermentation and written by The Gardeners & Farmers of Terre Vivante. This one was the precursor to the two above. This is the book from which I learned how to make sauerkraut. The title pretty much says it all. Chapters include lactic fermentation, root cellaring, dehydrating, and preserving oil, salt, sugar, and alcohol. A chart at the back of the book indicates which methods are best for which foods. Do you have a cookbook you'd like to add to the self-sufficiency book list? I'd love to hear your recommendations. Thanks for sharing! I may need to add these to my library. Great cookbooks thank you for sharing. I'll need to check out "Preserving Food without freezing or canning". This is a book I may need to add to my resource library. I've tried preserving with salt it works however, I'm not totally impressed. Happy 4th of July to you and Dan! Those look awesome but my hubby would flip his lid if I started going off grid. LOL! As it is he gets a bit annoyed with my penny pinching ways. But he does appreciate when the bills come in and are lower than last year. So I do get credit there. And he also loves having homemade pizza that tastes better than going out for it. I put the first two books on my Amazon wishlist. I already have the "Preserving Food" book and it is excellent. Warning: This appears to be Sandor Katz's magnum opus and mixed throughout the book is his world view which is bankrupt. If you can get around that, the information on fermenting is valuable. I lacto fermented a batch of green beans last summer and I let them go for too long. They were very sour when I finally canned them, but they are excellent with fried potatoes. I am going to experiment this summer as we have plenty of regular green beans put up from last year and I can afford to loose a few pickings this year. The garden is lush from the chicken poop I put on it this spring and the timely rains so far. Lucky me...I had one out of the 3...Preserving Food Without Freezing or Canning...now if you'll excuse me, I'm off to order the other 2! Can't wait to "flip" through Stillroom Cookery! I too want to get away from purchasing cheese cultures. Thank you for these valuable suggestions. i like the idea of using things on hand to make the cheese cultures, I find that's the biggest thing that stops me from time to time is reading a cheese recipe and then going "dang, now I have to stop and order/buy the culture" and that usually just grinds the whole project to a halt, ha. Off to check them all out. Happy and safe 4th to you both! Thanks for the reviews. I will see if our library has them. I love my Fanny Farmers cookbook. It has canning in the back. It also teaches you all about meat cuts and recipes for any vegetable or fruit. Ron, yes, that's a great website, and if fact how I found his cookbook. I didn't realize Sandor Katz wrote a book with Michael Pollan. I have Wild Fermentation, which has been a useful how-to on fermentation. For too sour veggies, they can be rinsed with plain water to cut the sourness. I do like your idea of finding something to pair them with. I find my strongest pickles go well with my strongest goat cheese! Lynda, i don't think you will be disappointed. Preserving Food Without Freezing or Canning was the first one I found, and the other two really round out the skill set. So much good old-fashioned information that is still useful today! And a happy 4th to you all too! Besides the cultures, Grace talks about how to make vegetable rennet, another must try for me. Oh yes, thumbs up for Fanny Farmer too. Also the older editions of Joy of Cooking, especially for fixing game and more exotic meats. If I ever need to cook a possum, I know where to find the info. That's another good example. Of course, my mom made mac & cheese with velveeta, so the boxed stuff never tasted good to me! I doubt I would like it now, however. We celebrated the 4th two ways: We turned off all our devices and talked to each other while we enjoyed our homemade nature park. We also celebrated our 17th wedding anniversary! I will read more about these books. My shelf is starting to overflow! Thanks for sharing Leigh. I actually have Grandpappy's Recipes for Hard Times. I'll definitely look the other 2 up. And, I just purchased the recently re-release of the original Joy of Cooking. Just had to come back and share, I snagged a copy of Stillroom Cookery on eBay last night. Yay! Can't wait to read it. Thanks again! I just love the older books, they are fantastic. I have a rather large collection of cookbooks (and similar). When I go thrift shopping, I always check the books first for anything dated before I was born, it's a great indicator for me as to what type of cooking/food preserving it will likely be. I'm going to check out the Grandpappy's book. Thanks! That's great! it's really a good read with lots of fun information. That is a great way to celebrate! And congratulations on 17 years! That's fantastic. I have to say that I enjoy investing in books, real books. In fact, I think I have too much information on the computer. I need to make copies of the really useful stuff. Wow, I didn't realize they reprinted the first edition of Joy of Cooking. Definitely need to look that one up. Good tip about buying cookbooks. So much good and useful information in the old ones. Thanks for sharing! I'm going to add them to my Amazon wish list!